HANOI, -- According to schedule, the evening of 2/2 transports Rolldock Star (the Netherlands) was carrying 186 kilos submarines - Danang to Cam Ranh Bay (Khanh Hoa). The fifth of the six Kilo-class submarines that Vietnam has contracted to buy from Russia arrived at Cam Ranh Bay in Khanh Hoa Province on Tuesday evening. The HQ-186 Da Nang, delivered by Dutch-registered cargo ship Rolldock Star, started its journey on December 16 from Russia’s Big port St. Petersburg. The submarine was laid at anchor near Cam Ranh Port and is scheduled to arrive at the port in the next few days. The sixth and final submarine named HQ-187 Ba Ria-Vung Tau, which was under sea trials, will arrive in Vietnam middle this year. The six submarines are built under a US$2-billion deal signed during a Prime Minister Nguyen Tan Dung's visit to Russia in 2009. 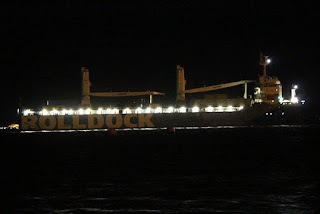 The Dutch-registered cargo ship Rolldock Star delivers the HQ-186 Da Nang submarine to Cam Ranh Bay.